China is set to become the world's largest producer of environment-friendly cars within 10 years, largely due to the central government's backing and the domestic car makers' ambitions to push electric vehicles, according to business consulting firm Bain & Company. The country is set to dominate the battery-powered car segment as the government has aggressively pushed for technology development, which in turn will breed more early adopters, said Marc Lamure, partner, Bain. 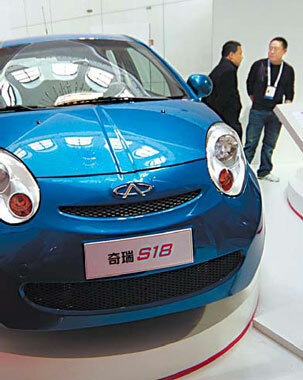 The State Council issued a plan in March aimed at turning China into a global leader in new energy cars, including electric ones, by 2011 with an annual production capacity of 500,000 units. "Electric vehicles are a big opportunity for domestic carmakers to compete with foreign brands, which still lead in the gasoline-powered vehicle segment. The government push will propel Chinese players into the big league," said Serge J Hoffmann, partner, Bain. Lamure feels that it would be easier for Chinese low-cost vehicle makers to switch over to electric vehicles than their international counterparts. According to Bain's recent survey of 500 car owners across China's large cities during the fourth quarter last year, budget-conscious "cost shoppers" are the major segment (60 percent). This compares with the mature car markets in Europe, America, Japan, and South Korea, where affluent customers constitute the majority (around 55 percent on average). The study showed Chinese shoppers had stronger requirements on price, recharging time, and socket availability, but had less demands on car developers and appearance. "At the end of day, it will be a price game, in which volumes matter. If an electric vehicle's price is within 100,000 yuan, its sales will reach 200,000 units over time, according to our survey," Hoffmann said. Bain estimated that global electric vehicle sales could cross the 1.5 million mark soon, depending on the supply capacity and technology development. A number of Chinese carmakers have scheduled to introduce electric vehicle models in the next 18 months. Prominent among them are market leader BYD's E6 scheduled for launch next year with a price tag of 250,000 yuan. Chery's S18 is also likely to debut with a tag of 70,000 yuan. The survey, however, indicated issues like battery technology and support infrastructure, still need to be strengthened before electric vehicles take off.